British company Garçon Wines has come up with a new way to package wine that cuts back on the costs and carbon emissions of transport. 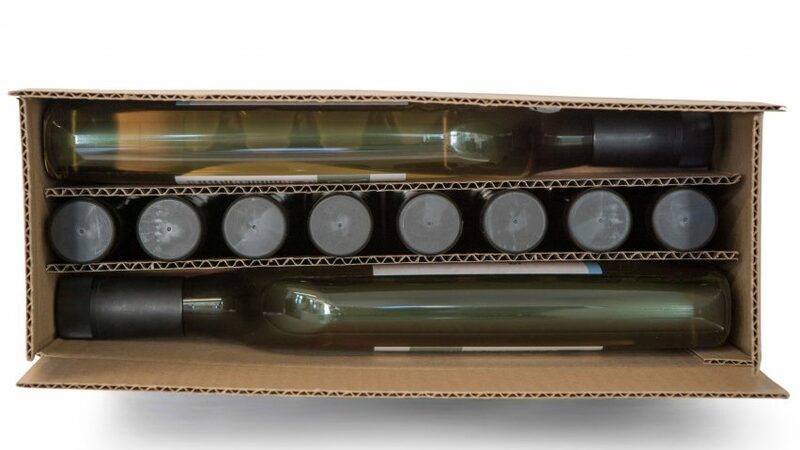 The company, which already manufactures flat wine bottles, has created a case that fits 10 of its products where there would be room for only four regular ones. The 10 Flat Bottle Case is designed to hold eight bottles vertically, with two more slotting horizontally into the space around the bottlenecks. Garçon Wines says this virtually eliminates empty airspace, and is achievable because the company thought about shipping from the beginning of the design process, making sure that the bottles' height and width would let them fit together. CEO and co-founder Santiago Navarro argues that current standard wine bottles are outdated, and that updating them is an environmental imperative. "Current wine transit cases used to transport six or 12 bottles of wine are inefficient and ineffective resulting in unnecessarily costly logistics, excessive packaging, wasted resources and a grotesque carbon footprint," he said. "The problems stemming from an unsuitable primary pack – a 19th-century wine bottle – are amplified into secondary packaging that is equally, or arguably excessively, unsuitable." "Excessive use of packaging at a time when we need to be more resource efficient is unsustainable. Furthermore, mitigating against climate change has become an existential necessity," Navarro continued. Garçon Wines created the cardboard case in partnership with packaging company DS Smith. Currently, the commonly used packaging for transporting wine is a six-bottle case, which normally gets 456 bottles into a standard pallet. With Garçon Wines' case, that more than doubles to 1040 bottles. As well as the environmental benefits, the more efficiently used pallets would reduce costs in handling, storage and transport. Although wine is just one small area of shipping and handling, Navarro says that the product can have unusual influence because it captures consumers' imaginations. "Wine is a uniquely engaging product with a high emotional connection," said Navarro. "It therefore provides a unique platform from where to communicate a change in the way we do things to help mitigate against a climate change catastrophe and create a more sustainable economy." If hypothetically the UK were to switch half its annual wine consumption — of 1.5 to 1.8 billion bottles — to wine that was packaged and shipped in this way, Garçon Wines says that would take 42,000 trucks off the road each year. The company initially made its slimline bottles to enable wine delivery through UK letterboxes. It has since picked up multiple awards for the design, including a UK Packaging Award and a World Beverage Innovation Award, and was a finalist in the Sustainability Awards. The bottles are made from recycled plastic and hold a standard 750 millilitres of liquid. Garçon Wines launched its complementary case design at trade fair Packaging Innovations Birmingham 2019 this week. Other recent sustainable moves in packaging have included Carlsberg replacing plastic ring can holders with glue and The Guardian newspaper replacing its plastic packaging with a biodegradable alternative made of potato starch.